A biochemist by training, Mark Fisher has worked in the pharmaceutical industry and in pure science. In a change of direction, he qualified as a Permaculture Designer, and did work in landscape design. Mark launched a manifesto for rewilding Britain in 2003 having been inspired by hiking the National Parks and open spaces of Canada and America. 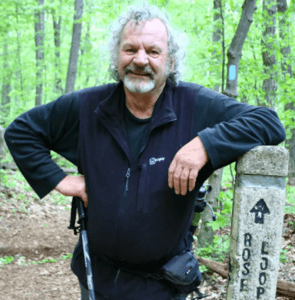 He taught himself about wilderness ecology and rewilding, and explores these through his website Self-Willed Land, an advocacy website since 2003 for wild land and nature. His focus is the transformation of Britain through rewilding, a new future where landscapes of increasing naturalness will have open access to the public for physical discovery and spiritual enjoyment. Mark recently became a member of the IUCN Commission for Ecosystem Management as a result of setting up with others a Task Force on Rewilding in response to the drift in its meaning. Mark was a co-founder in 2005 of the Wildland Network, a voluntary organisation set up to further the concepts and development of wildland in Britain. The Network attracted a large cross-section of interest from professional ecologists, land managers, government agencies, voluntary organisations and individuals, to its program of theme-based meetings around Britain that were combined with local study visits. He was instrumental in the development of a database of rewilding projects in Britain for the Network. In 2009, Mark was a co-founder of the Wildland Research Institute at the University of Leeds where he advises on ecosystems and policy development. His work for the Institute includes research on the effect of visual and audio stimuli for perceptions of landscape; a report for the Scottish Government on the national protected area systems of Europe, their legislative basis and implementation, and their ability to protect wild land; a report for the John Muir Trust on options for the protection of wild land in Scotland; the production of a register of wilderness areas and indicator in Europe for the European Commission; a review of the social, economic and environmental benefits of wild land in Scotland for Scottish Natural Heritage; and a book chapter on the ecological values of Europe’s wilderness. The drift in definition and focus of original definition and practice of rewilding in Europe. How to find inspiration and purpose for a career or focus on rewilding work. Fisher is referring to Knepp re the 4k acre farm. I suggest you talk to the owner to get their views on what rewilding is and why they did it.